How do you know whether your profits are "good" or "bad"? Of course, the answer to this is to ask them! This can be achieved in a number of ways, including the use of customer surveys and customer advisory boards or focus groups. Now, if you are interested, I can publish an article on how a customer advisory board (CAB) can provide you a great insight into the mind of your customer - the CABs' that I have facilitated for clients have provided valuable feedback and suggestions - just let me know! Just for now, I'll focus on customer survey. Now, we all have received customer surveys in the past - you know the ones, a page or two of boring questions. And if you make any suggestions or comments, you really don't expect an response or reaction from the business. However, the use of customer surveys with pages of questions does not practically give you and overall indicator of customer satisfaction - nor any indication of the underlying trends in your level of customer experience. This shortcoming of the usefulness of customer surveys has been recognised in a book written by Fred Reicheld called "The Ultimate Question – Driving Good Profits and True Growth. 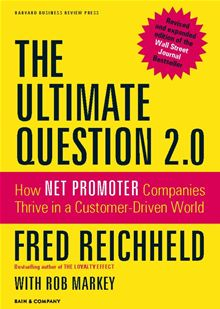 In this book, Reicheld suggests that there is one, and only one question that needs to be asked in order to provide a simple assessment of where you level of customer experience is by providing you with a simple index. That simple question is "How likely is it that you would refer us to a friend or colleague?" And the simple index is termed the "Net Promoter Score" or NPS. The NPS has been used by business in the USA over recent years and is designed to give an indication as to whether you are earning good profits or bad profits. Good profits are profits which will be recurring because you have delighted customers. Bad profits are short term and are earned from customers who are "indifferent". Delighted customers are "promoters" and indifferent customers are "detractors"
"How likely is it that you would refer us to a friend or colleague?" The net promoter score is the difference between the % of responses who are promoters to the % of responses who are detractors ie P%-D%. Obviously a +ve score is preferred - however, many businesses have -ve scores. The aim to manage the trend so that it is moving upward. The advantage of monitoring this trend is that it is an indicator of future performance. "What would it take for us to move your score to a 10?" Further, you could also ask "would you be prepared to discuss your response with us?" - If so, they could put their name and contact on the form. The net promoter score is an important Key Performance Indicator and should monitored monthly with your normal monthly financial reports. Are you prepared to give it a go?